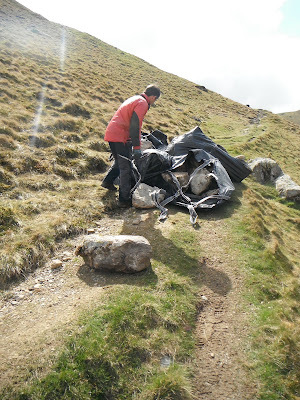 As usual, our upland footpath work season began with a few weeks of filling bags with material to be flown by helicopter to the work site. 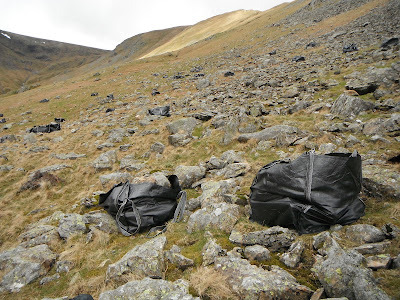 We filled around ninety bags with rock from scree opposite the path where we're working. 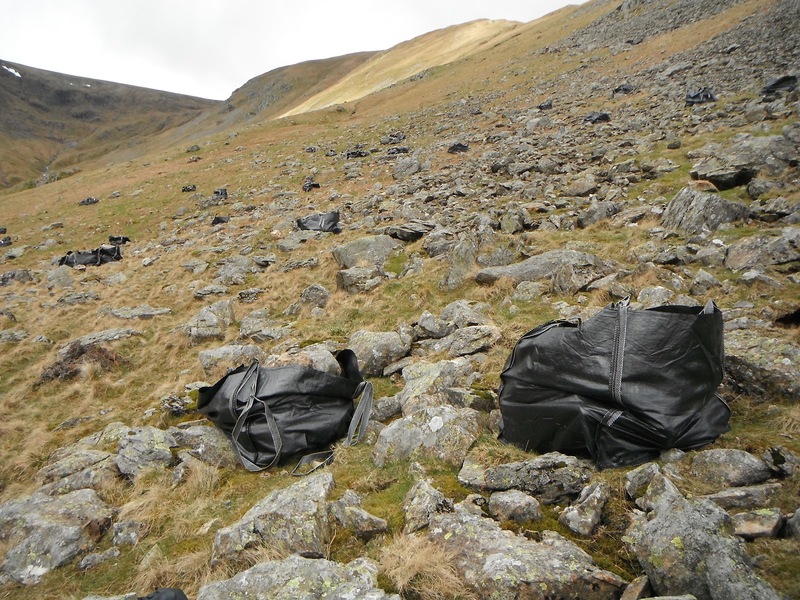 The bags were flown a few hundred metres across the valley and dropped around each of the areas that we'd identified to be repaired. 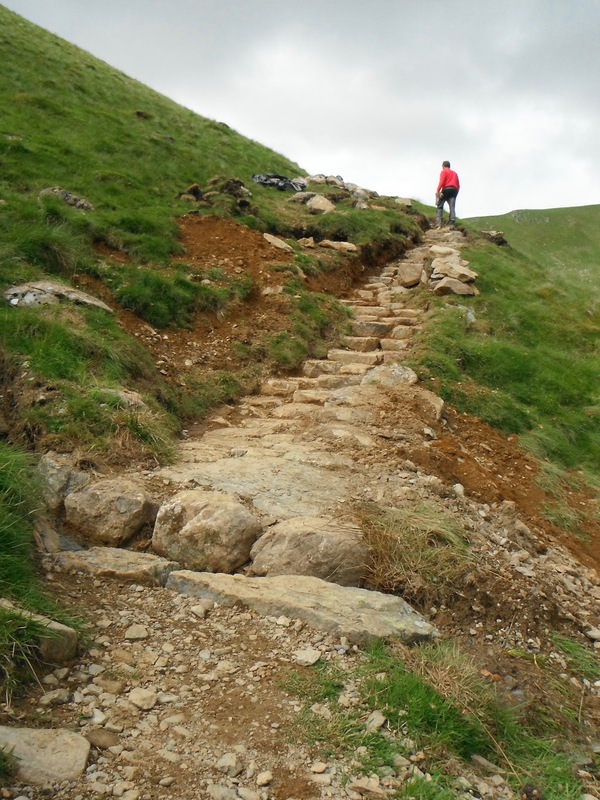 Many of the sections of path that we're repairing on Seldom Seen are only around a metre in length and will prevent the path from getting worse. 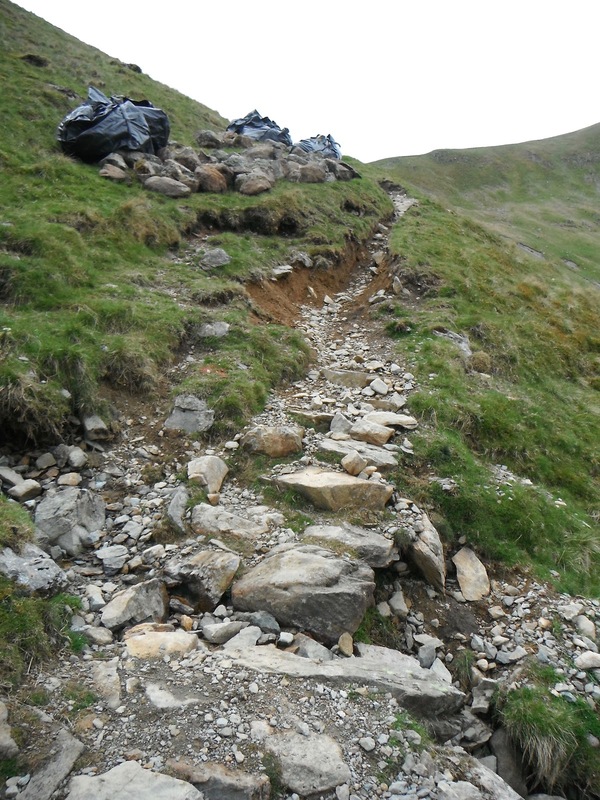 The section below had started to wash out and then deteriorated further after the winter flooding. To stop the path getting worse, we built a short section of pitching and a stone drain. 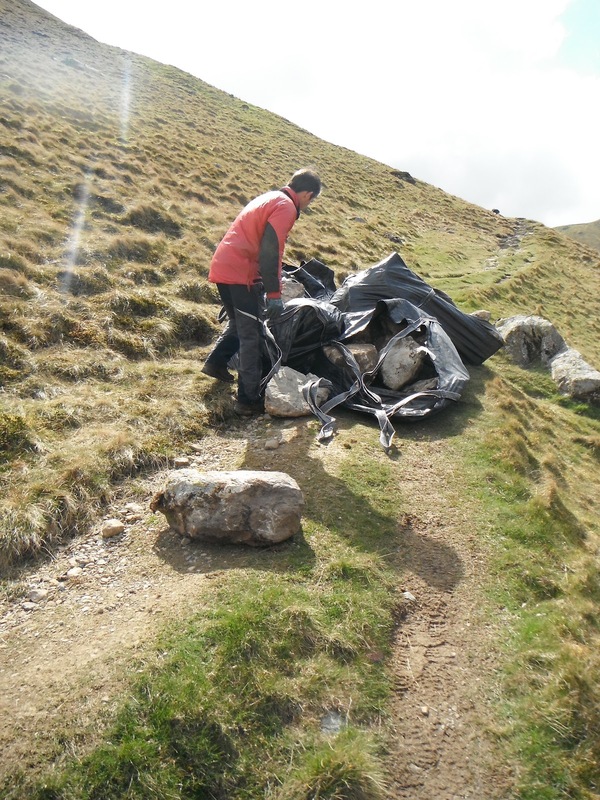 This will allow the water to be shed away from the path rather than run down it. Soil excavated while building the path was put downhill to fill in some of the gully caused by the flow of water. You can see in the photo below that rock has been dug in further along the path on the right hand side, to direct walkers onto one line and prevent the path getting too wide. Fixing the drainage on this path is one of the main aspects of the job, as water running down it is starting to cause problems, and the path has shown significant deterioration over the last few years. 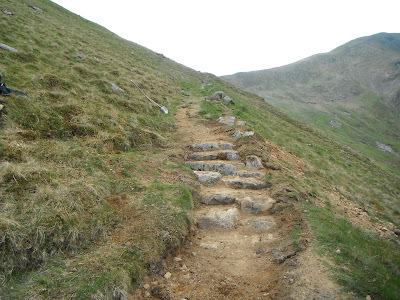 Another section that has badly gullied out can be seen below. The original short section of pitching and drain isn't really up to the job. 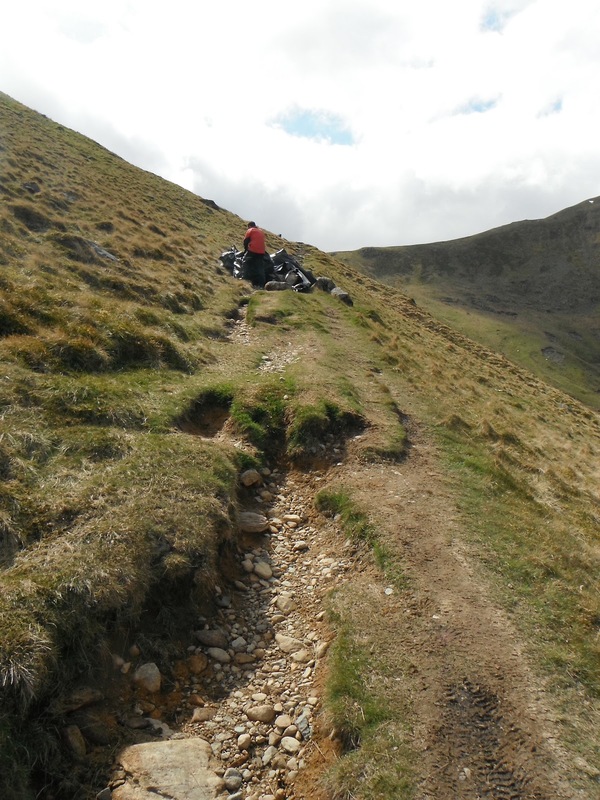 For this section, we moved the drain about a metre downhill to the bottom of the pitched path. 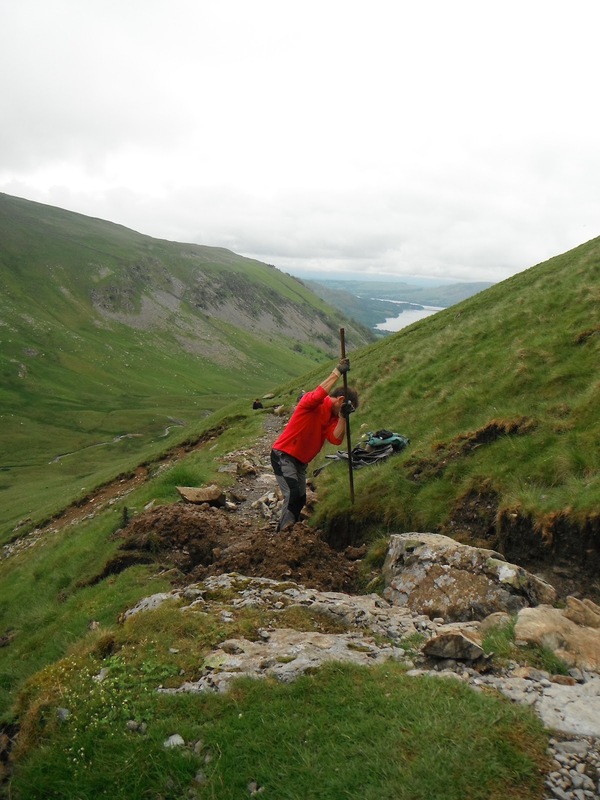 This drain is fed into by a small beck, which was realigned with the new drain. The path has also been extended through the gully and incorporates another drain at the top of the path to shed any water running down the path. There's still some landscaping work (grading banks, turfing and reseeding) to be done but it's a big improvement on what was there and will help prevent it getting any worse.